Calling all kids from age 4 to 94 are invited to attend in their PJ’s or costumes for Sammy Snail’s Puppet Pajama Party! Video Clip. September 10 @ 11 am and 3pm! These fun-raising performances benefit the Jeanne Geiger Crisis Center’s Youth Programs. Come join in the adventures of Sammy Snail (shhh… he’s a puppet but don’t tell him) on stage, on screen and in the aisles; for a heart-centered mission to turn the world right-side-up. Our spunky little super hero braves misunderstandings to show us what the world needs now: peaceful resolution to hilarious mix-ups. Come in your PJ’s or not, but don’t miss the music and laughter of a puppet extravaganza with a cast of giant-size puppets, dance numbers and segments of the pilot episode of Sammy’s New World! Sammy’s PJ Party is reclaiming skills to achieve a loving, peace-filled state quickly; scientifically researched by HeartMath and The Connection Practice. This one hour and ten minute family show features live puppetry and ventriloquist performances interwoven with music, comedy, dance, drumming and innovative use of multi-media performing arts. The event also includes a diverse cast of talented local performers, puppeteers and dancers including students from Joppa Dance Company, Imagine Studios and Zach Fields Drum Studios, puppeteers including Mary Irons and songwriter Meg Rayne. Lesley Smith is a New England Foundation for the Arts Touring Artist and world-class ventriloquist and puppeteer who worked with the best TV puppeteers in the business to serve up a one hour musical comedy wrapped in a positive message. She has been featured on Chronicle as a New England performance artist and has performed nationwide. This fun-raising performance will benefit the Jeanne Geiger Crisis Center’s Youth Empowerment Services (YES) Program and support Imagine Studios community outreach project, Sammy Cares, a peace building performing arts program. Sammy Cares programs benefit communities by providing free or low cost shows in schools, daycares, hospitals and homeless shelters. Sammy Cares interactive performances include ventriloquism, theatrical puppetry and music to reach every age and learning style. About the YES Program For 35 years, the Jeanne Geiger Crisis Center has been helping individuals and families at risk because of domestic violence. In order to break the cycle of violence before it affects the next generation, the Jeanne Geiger Crisis Center offers an innovative Youth Empowerment Services (YES) Program that uses evidence-based and nationally-recognized approaches to educate and engage girls and boys in breaking the cycle of domestic violence. Through three linked initiatives, we empower girls, foster healthy dating relationships, and engage boys and girls in violence prevention, with an emphasis on reaching students in upper elementary school through high school. Last year, YES programming was provided to 2,906 students and faculty in 8 schools across Essex County. For more information call 978-465-0999,[jeanne geiger crisis center] 24-hour confidential crisis hotline at 978-388-1888. “This has been the talk of the town. I have had people coming up and asking, “Were you at the pajama party”?! They went on and on about the show. We all had a great time! This is a beautiful program for children and families.” -Cherie, Newburyport, Sammy Cares Community Outreach peace building, bully prevention programs Featuring Lesley Smith and her characters! Sammy Cares features live, multi-media performances of New England Foundation for the Arts Touring Artist, world class ventriloquist, vocalist and puppeteer Lesley Smith, and her characters, starring Sammy Snail. Sammy Cares nonprofit programs benefit communities by providing free or low cost inspiring programs for children and families at-risk in schools, daycares, hospitals, theaters and homeless shelters. These interactive performances include ventriloquism, theatrical puppetry and music, promoting social competency skills, conflict resolution, environmental stewardship and healthy lifestyles. 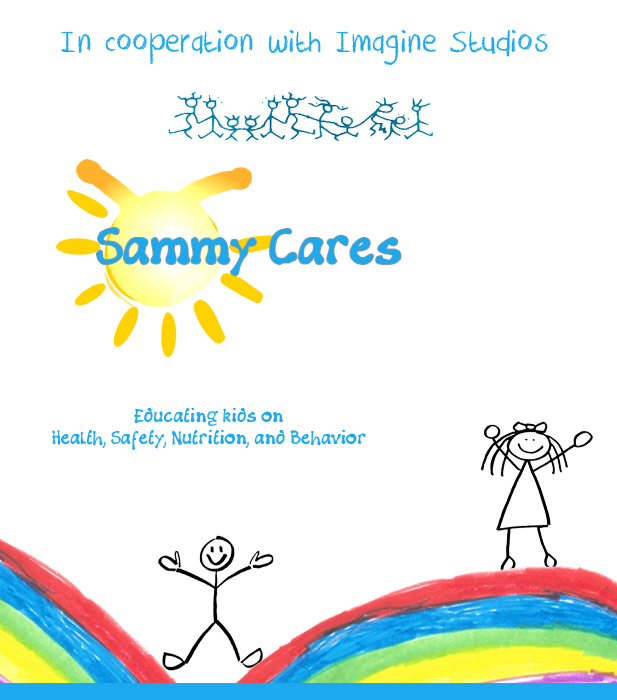 Sammy Cares…Peace Building Programs for Schools and Communities. Imagine Studios is dedicated to fostering and promoting the performing, visual and healing arts through folk and multi-cultural music, dance, theatre, art, puppetry, poetry, and related activities for all ages. Our community outreach projects provide high-quality, affordable, purposeful performing arts programming. Regional business and community leaders are joining together to make a meaningful impact on the lives of children. Through business sponsorships and community foundation grants, Sammy Cares offers discounted rates to underserved schools, agencies and populations throughout the seacoast region. Sammy Cares’ mission is to create a more peaceful world through modeling love of self, others and the living earth. Outreach programs target pre-K- 6th grade, family audiences and elder communities. Lesley Smith and her characters have toured extensively in rural, urban and suburban school districts and concert halls reaching audiences of diverse ethnic, socio-economic and geographic backgrounds. Whether it is 1st or 8th graders in upstate rural New York, Whiteville North Carolina, or the inner city of Roxbury MA (Boston) the response is always the same, “Sammy and his friends rock”! Live theatrical school assemblies and shows focus on conflict resolution, bully prevention, environmental stewardship and good eating habits. Live multi-media puppetry performances engage audiences of all ages with interactive participation and include underserved adult and elder communities. Also find Sammy Snail on Facebook, Twitter and Instagram. Booking Information: Imagine Studios, Kristine Malpica Kristine@imaginestudios.org, 978-834-0367. Target Audience: Preschool-2nd, 3rd-4th, family nights, Residency programs for older students that teaches puppetry, ventriloquism, drumming and performance skills. Giant sized dragon and lion puppets promote responsible action, character and citizenship as we bring Elizabeth Winthrop’s classic Castle in the Attic to life. Packed with interactive music, intrigue and humor, this program supports the importance of healthy relationship skills for social and academic success. Teacher and parent workshops: Lesley Smith teams up with Dr. Christopher Thurber, a school psychologist at Phillips Exeter Academy, board-certified clinical psychologist and founder of Expert Online Training to provide concrete help in the area of bully prevention with family, parent and staff training. Puppetry: Students will be trained in simple puppetry techniques to bring a puppet to life. Children and young adults will learn lip sync, emotions, movement and simple choreography for a live group puppet performance. Drumming: Students will be trained in basic African drumming techniques and singing. Drums will be provided. Workshops Availability: Separately or to be added onto all stage shows for additional cost. Can be held during school day or after school. Can be restricted to organization or open to general public. Trained drummers and puppeteers have the option to perform in a live performance in school or open to the public. Minimum of two 1 ½ hr workshop to be included in live performance. Target Audience: Preschool-2nd, family nights, Residency programs for older students that teaches puppetry, ventriloquism, drumming & performance skills. Audiences learn to recognize emotions in others and ourselves. Promote social competency skills by naming feelings and recognizing needs. Hilarious predicaments contrast thought-provoking situations in an interactive enchanting medieval story line. An absolute delight for the youngest to the oldest audience member. Just Breathe:The quest for a little piece of mind…& chocolate! This one act musical performance has been presented with the “Women in Comedy Tour” with comedian Loretta Laroche, at theaters and organizations across the North East and Canada. Lesley integrates her unique gifts as a world-class ventriloquist, singer, actress and humorist to create a transformational feel good show. Unstoppable commitment and the power to believe in oneself, are just a few of the byproducts of this show. “I could just sit here and watch you (Lesley Smith and her characters) all day!” Cheryl Richardson, NY Times best selling author, Host of PBS and Oxygen Specials. Sammy’s New World is a heart-based children’s entertainment brand. The mission is to entertain while empowering children and their families to create a more peaceful world through love and respect of oneself, each other and the living earth. “Sammy” is entertainment first and foremost, starring a funny “do-gooder” of a snail. Sammy’s New World is a high production digital experiences to be delivered globally through an innovative platform. The Sammy real-world experience will be expanded through live interviews, performances and appearances on the world-wide circuit with our partner organizations as an entertaining “spokeschild” for a loving and peaceful world. Available: Video shorts, promo materials, news releases and press kit.